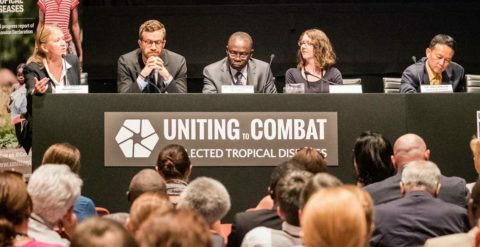 Uniting to Combat NTDs is a collective of invested, interested and dedicated partners, working to fulfil the London Declaration on Neglected Tropical Diseases. Drawing inspiration from the World Health Organization (WHO) “Roadmap for Implementation”, which outlined bold targets for the control, elimination or eradication of 17 Neglected Tropical Diseases (NTDs) by 2020, leaders of several prominent global health and development organizations, together with industry partners, met in London in 2012 and pledged to unite in their efforts to support the achievement of the WHO 2020 goals in respect to 10 neglected tropical diseases. These diseases had essential ingredients for immediate support. 5 of these diseases can be controlled through what is known as mass drug administration—that is, large-scale population treatment with safe and effective medicines and the other 5 can be controlled by what is known as innovative and intensified disease management (IDM)—that is, individual diagnosis and treatment, surgery where needed, care and rehabilitation of infected individuals. These collective promises of support were formalized into the London Declaration on NTDs, and it is around this declaration that the coalition of partners called Uniting to Combat NTDs was created. Since then, partners have been working alongside WHO and national programs to address the neglected disease burden in some of the world’s hardest to reach areas and tracking their progress towards the 2020 goals through an annual scorecard which is published on this website.